QB Baffles are 2″ thick fiberglass baffles cut to the standard size of 24″ x 48″, although custom sizes are also available. 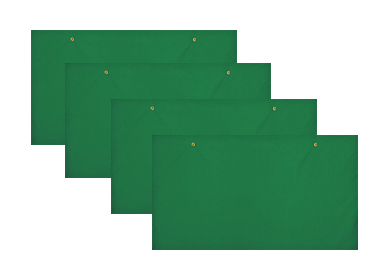 These acoustical baffles are made from a fiberglass core encapsulated in a vinyl cloth cover. 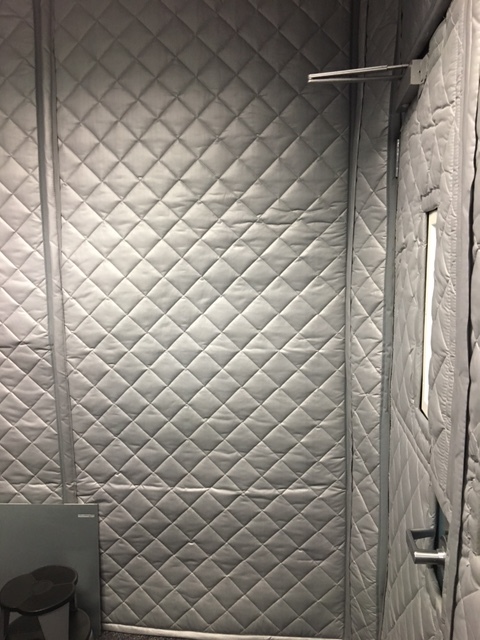 The sound baffles are then run through a stitching machine, the edges are bound, and grommets are punched into these sound absorption baffles at the two corners for vertical suspension. Ideal for controlling unwanted sound reflections in large industrial settings where soundproof ceiling treatments help control decibel level exposure. 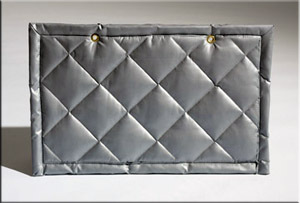 QB Baffles are a member of a larger family of acoustical blankets offered by NetWell Noise Control. QB Blankets are the extension in size to the QB Baffle, where blanket sections up to 25’ tall can suspend against perimeter walls in your factory, while the QB Baffles suspend overhead. Also to note, the QBS Barrier Blankets can be used as an enclosure around the noise-infested area to deaden directional sound. QB Baffles price at $48 each for a 4’ wide x 2’ tall baffle. Orders can be called into our sales desk at 1-800-638-9355 or purchased online using the link below. 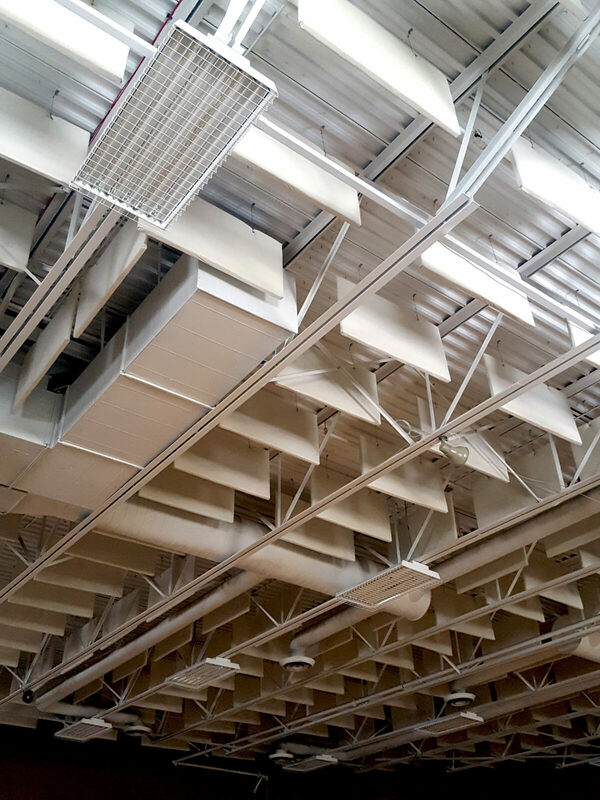 Note that NetWell offers a variety of sound baffle options, including the most popular which is called a VET Baffle. These sound baffles perform to the same values as the QB Baffle but are a less expensive product to produce. Passing these savings on to our clients, the VET Baffles are about half the price of our QB Baffles. QB Baffles are designed to suspend vertically from your ceiling in rows and columns spread out across he expanse of your room. The key to the values you are seeking rest in placing the right amount of baffles into your space. Be sure to check with NetWell or submit a Room Analysis to get the number right. QB Baffles will be boxed and shrunk wrap on a pallet to ship via common carrier to your project site. For questions related to your upcoming soundproofing treatment, contact our help desk at 1-800-638-9355. Our popular Room Analysis is complimentary. Use this innovative tool to help us define the scope of your treatment and quote your project back. To quote your QB blanket project, call our help desk at 1-800-638-9355 or use this form to submit the dimensions of your project, and we will submit back your quote.